Ezekiel prophesied in about 590 BC when the nation of Israel was in captivity in Babylon. He gave many fascinating prophecies, including this vision of a valley of dry bones (Ezekiel 37:1-14). 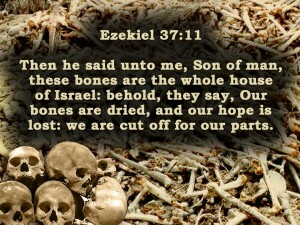 The well-known spiritual song “Dem dry bones” refers to this prophecy. It is a very clear prophecy with each element of the prophecy being explained in the chapter. Ezekiel’s vision was of a collection of dry bones lying at the bottom of a broad valley. The bones come together and were covered with tendons, flesh and skin, but the bodies that were formed remained dead. Then breath entered the bodies and they became a vast army. Observe throughout that it is the LORD who is going to revive His politically ‘dead’ people, yet it is the ‘Son of man’ who initiates each step. Ezekiel is the Son of man who participated in the vision, but the Son of Man who brings it to reality is Jesus Christ. The condition of the bones was unchanged until the Son of Man acted. (In Luke 17:37, Jesus himself foretold that the Roman eagles would gather together to devour the body of Israel). In verses 11-14, the prophecy is explained. 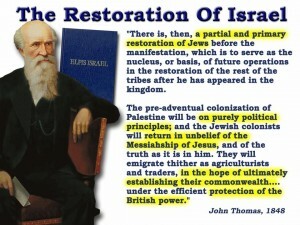 It depicts Israel’s revival in two stages. Jews were to be gathered out of many nations around the world. They were to become one nation in the land of their ancestors, the land of Israel. This is precisely what has happened over the past century. No other nation has maintained a national identity after more the 1800 years of exile. But no other nation has had these prophecies made concerning their history. Other nations that have been dispossessed of their land have lost their identity within a few years. What has happened to Israel is extraordinary. The Jews are a standing miracle, a wonderful example of fulfilled prophecy. The fact that their history was predicted so accurately shows the Bible is God’s book. We have only seen the first stage of Ezekiel’s prophecy fulfilled. 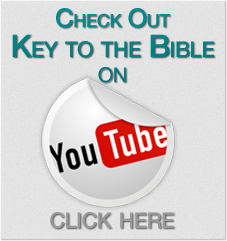 Israel has returned to their land as predicted, but God’s spirit does not yet dwell in them. A recent survey revealed that most Israelis do not consider that God is responsible for their current position and survival in the land. These prophecies indicate that they are yet to become a religious nation relying on God and obeying Him. This second stage, when breath came into them and they lived, will also be the work of Christ, who will “gather the elect (nation) from the four corners of the earth” (Matthew 24:31). At his return he will cause a national repentance when his people at last recognise him and mourn for what was done to their saviour (Zechariah 12:9-14; Romans 11:26). 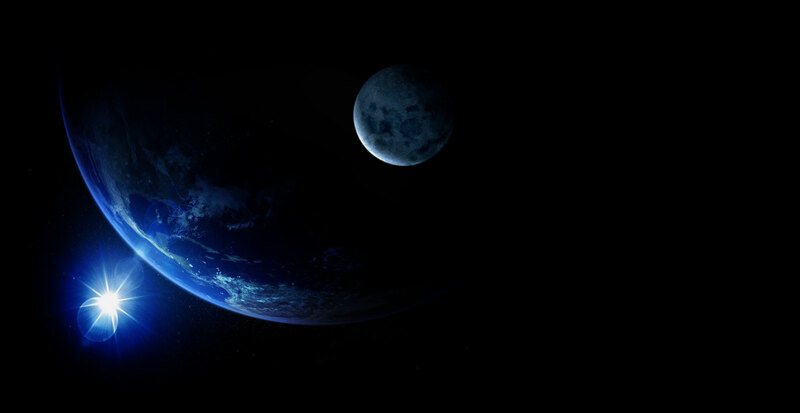 The last stage in the prophecy is described in verses 24-28. After the Jews turn back to God, they will have a new king “David” who will rule over them forever in peace. Luke 1:30-33 makes it clear that this king will be Jesus, who is a descendant of the earlier King David of Israel. He is to sit on David’s throne in Jerusalem. We can be confident that the Jews will turn back to God and that Jesus will return to be king, because the first part of this vision has been fulfilled. The Jews are back in the promised land as predicted in the Bible. LINK TO Why is the Nation of Israel being restored?